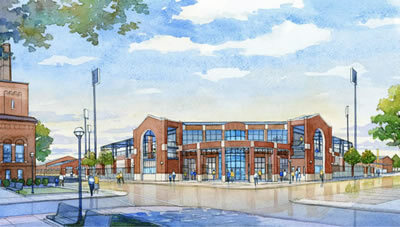 The Wilpon Baseball and Softball Complex project is an approximately 8,000 gross-square-foot renovation within the existing Fisher Stadium and approximately 10,000 gross square feet of new construction. The project will include accommodations for barrier-free spectator areas. The existing grandstand will be upgraded to include new seating and finishes. The project also will include additional public restrooms, concession areas, expanded media space, team clubhouse and locker rooms, coaching offices and indoor practice facilities for the baseball program. Improvements for pedestrian circulation including a public plaza at the stadium entrance and a new “Blue Monster” wall at the rightfield fence will further enhance the game-day experience.